A user with Finance access can initiate the bill advertising clients. This Billing queue list will at all times be populated with billing line items from Deals that have been signed. As each Deal is created by the sales team, using a specific billing model and payment terms, a billing schedule with line items is automatically created for every Deal. When the date for the billing schedule is reached, the billing line items appear up in the Billing queue in the order they can be billed if you sort the list by Earliest billing date. Tick off the billing line items that you want to invoice. This is done by ticking of the checkbox on the left hand side of each line item. By clicking the Preview button, you can preview the invoice just to make sure that everything looks good before you issue the invoice. A PDF will be generated but if you look closely on it you'll see that it hasn't been assigned an invoice number. 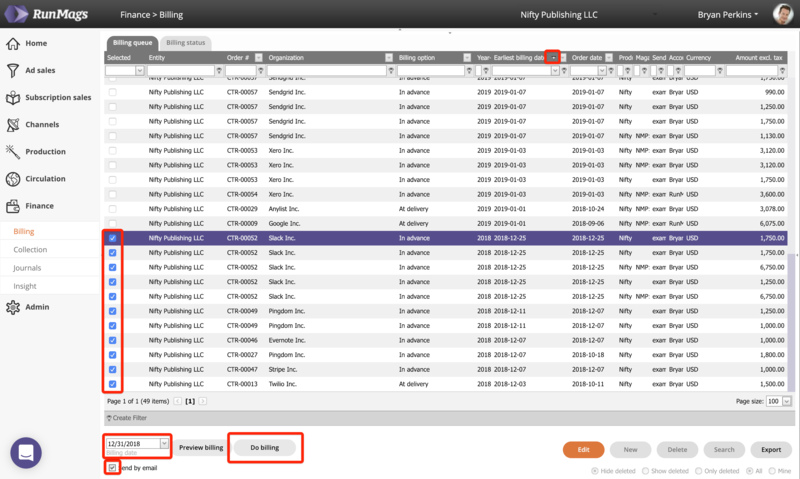 By clicking the Do billing button, you can create a single invoice or bulk-create invoices for a bunch of line items. A PDF will be generated and if you look closely on it you'll see that it has been assigned an invoice number. See this article if you accidentally created an invoice with errors in it. The PDF invoices can be printed to send them by mail. As they have been created they can also be viewed under the client record in Ad Sales >>> Organizations >>> Invoices tab as well as in Finance >>> Collection. Set up an email address in your profile so that emails are sent out from RunMags. Make sure that a client contact (with a correct email address) is assigned to be the Finance contact for the Deal you want to invoice off. Once the above is done you can tick off the Send by email box to send the selected invoices by email to the assigned Finance contact for the Deal. RunMags will then use the email template called Invoice submittal for sending invoices attached as a PDF in the email. The email templates can be found in Admin >>> System settings and Email templates. RunMags comes with Stripe and PayPal integrations which means you can allow for advertisers to pay their invoices using their credit card. They can even set up their card and allow for automatic billing of their credit card in the future. For each client contact, RunMags will create a secure portal and a unique encrypted URL. The URL is displayed on the contact's record under the client account. That contact-specific URL can be automatically included in a link in the Invoice submittal email template. That way, when a client receives the email with the invoice attached to it, there will also be a "click here" link in the email that leads the client to his or her portal where they can set up their credit card and pay the invoice. To set up the advertiser portals and allow for clients to pay using their credit cards, please see this article.